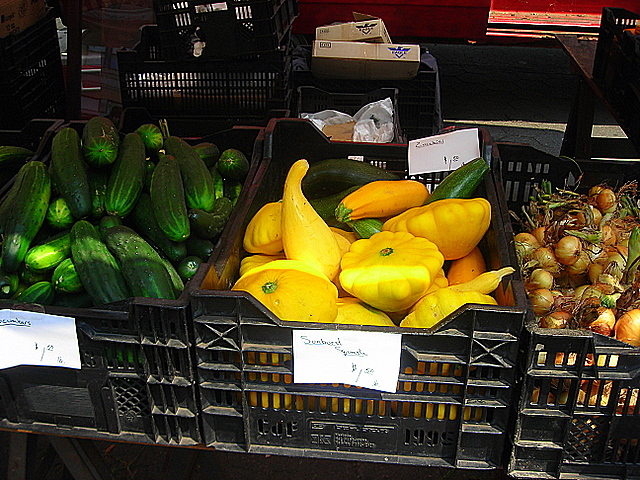 According to Wikipedia, summer squash are a subset of squashes that are harvested when immature (while the rind is still tender and edible). All summer squashes are the fruits of the species Cucurbita pepo (although not all squashes of this species are considered summer squashes), but they are considered vegetables in terms of culinary use. 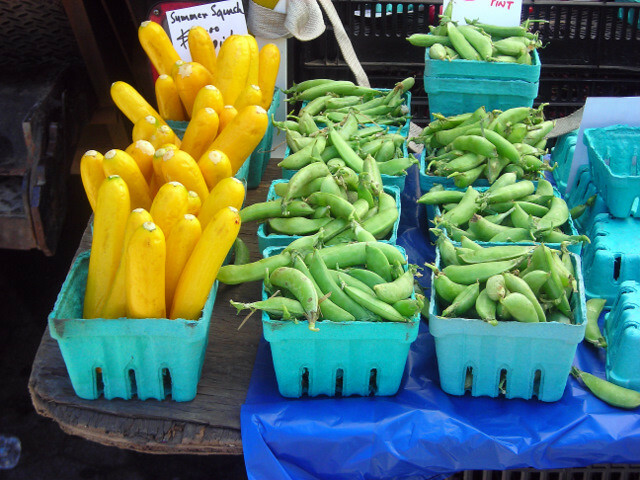 The name “summer squash” refers to the short storage life of these squashes, unlike that of winter squashes. Globe zucchini — This is an heirloom variety of zucchini that’s notable because of its shape. 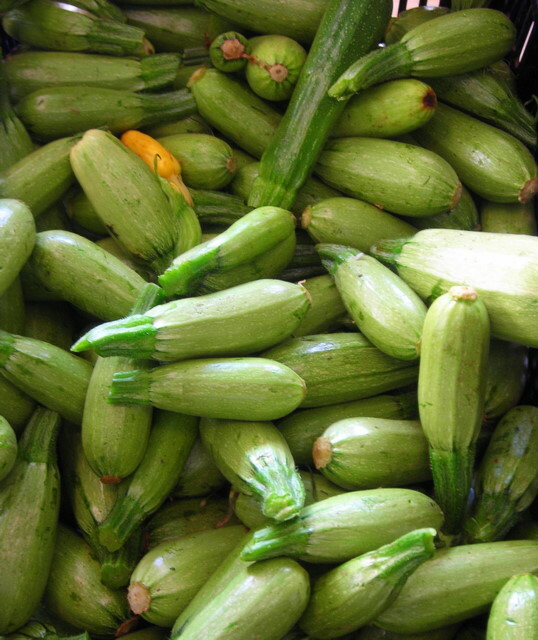 Can be used in salads, baked, stir-fried or in zucchini bread and works especially well for stuffed zucchini recipes. Crookneck squash and sunburst squash — Named for its crook-shaped neck, this summer squash usually has large seeds in addition to possessing an exquisite taste. Sunburst squash are usually very young and acorn shaped. They develop a smooth outer skin accented with a scalloped edging around their equator. Can be steamed, sautéed or boiled, eaten as part of a crudité platter or used in salads, soups and stews. The gratin recipe is adapted from Alice Waters’ The Art of Simple Food. Serve with a salad, bread and a chilled glass of white wine for a light lunch or supper. Heat olive oil in a skillet over a medium-low flame. Add onion and sauté until softened, about 8 to 10 minutes. Remove pan from heat. Place a tablespoon of onion on the bottom of a gratin dish or Pyrex baking dish. 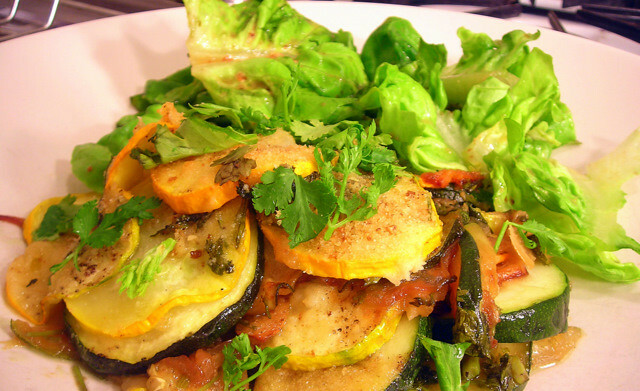 Add a layer of summer squash, then some garlic and parsley. Season with salt and pepper. Drizzle a little olive oil. Repeat, until all the vegetables are used up. You can, if you like, add some Parmesan cheese between layers, or top the gratin with a tablespoon of cheese and fried breadcrumbs. Cover with a piece of parchment paper and cook until the squash is translucent. If you don’t have parchment paper, loosely cover with aluminum foil. Take off the parchment paper or aluminum foil, press the squash down with a wooden spoon or spatula, and bake until tender and lightly browned on top. Time: 1 hour, including prep. This will be my entry for Weekend Herb Blogging #243 hosted by Huan from Eat.Read.Live. and organized by Haalo of Cook Almost Anything. Weekend Herb Blogging is a foodblog event originally begun by Kalyn of Kalyn’s Kitchen. 21 Jul	This entry was published on July 21, 2010 at 1:41 am. 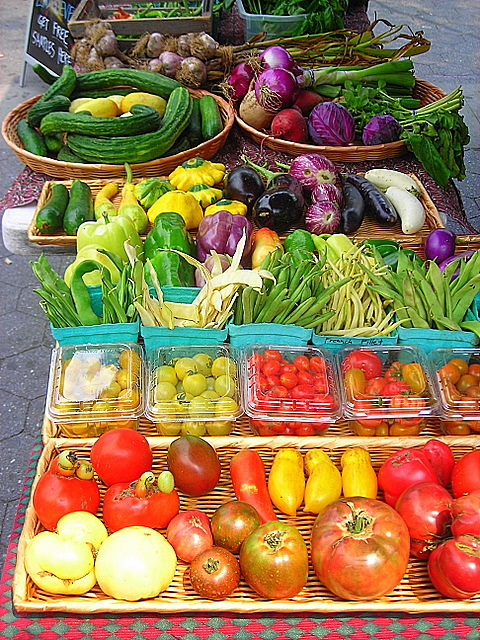 It’s filed under Alice Waters, food, general, summer, vegetarian, Weekend Herb Blogging and tagged dinner, farmers' markets, gratin, heirloom vegetables, lunch, red onion, seasonal and local, slow food, summer squash, vegetarian, zucchini. Bookmark the permalink. Follow any comments here with the RSS feed for this post. We’ve been getting summer squash every week in our CSA box for weeks now, and I’ve been looking for something interesting to do with them (recently we’ve broiled them, fried them and had them in curry.) The recipe looks good (and is from a book I was planning on borrowing from a friend); we’re going to try it tomorrow for dinner. Nice pictures and info too. Hi Alex. Thanks for visiting and commenting. I should caution that the recipe as written serves one so you’ll probably want to consider doubling the quantities involved. Alice’s version suggests 6 medium-size squashes and serves 4 (possibly 2 entrée-sized servings). Adding potatoes to the gratin will contribute some heft. We made it, and it turned out really really well. I made some modifications (both out of necessity and by choice), which I will probably turn into a post in the near future. Thanks for putting up the recipe!